The item is a quick and easy way to inflate your pool floats and other inflatables. The pump is portable and lightweight so is perfect for usage indoors as well as outdoors. The pump is supplied with three nozzle attachments to suit all standard valve fittings. A super easy way to inflate pool floats, inflatable boats, and airbeds. Portable and lightweight. 3 nozzle attachments and1 AC 220V-240V130W 50Hz air pump included. Efficiently pump large inflatables in no time. AC powered electric pump for convenient application. 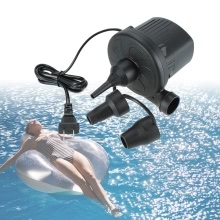 Include three interconnected and switchable nozzles for different inflatables. 220-240V connects to electric outlets. A super easy way to inflate pool floats, inflatable boats, and airbeds. Note: When using the pump, please rest for 5 minutes in every 10 minutes with big nozzle, and rest for 5 minutes in every 5 minutes with small nozzle. Do not expose it to rain or any other wet condition. Store indoor.